How many times have you heard “VDI stinks!” And how many times have we heard this because an assumption was made that everyone in the organization was a fit for a virtual desktop? Certainly there are many factors that affect the success of a given VDI project but in this series of posts, I want to look at using Liquidware Labs Stratusphere FIT for VDI Assessments, specifically, installing and using this tool to perform real performance and data collection prior to the VDI rollout in order to properly plan and execute a VDI initiative. In the simplest terms, Liquidware Labs Stratusphere FIT is used to evaluate physical machines to see if they fit for VDI. FIT generates details reports (there are 141 built-in reports) providing insight into an organizations desktop resource consumption in regards to networking, storage, CPU, and RAM among others. The information gathered becomes the basis for a proper design and sizing of datacenter resources and virtual desktops. Stratusphere FIT is downloaded as a virtual appliance(s) and is used by all the major players to perform VDI assessments. There are virtual appliances for VMware, XenServer, Hyper-V, and RedHat if I recall correctly. Stratusphere has three components: the Hub appliance, Database appliance, and Network Station. The Application Hub, a database and the Connector ID Keys (agents/physical computers) are the only components needed during the assessments, network stations are NOT REQUIRED. The hub appliance is required and forms the central management and reporting core of the Stratusphere platform. The Stratusphere Database Appliance (SDA) is an optional component used to store information when more than 1,000 desktops will be evaluated. This option allows a higher volume of CID Keys (agents) to call back to the Stratusphere Hub and a high performance option for better user interface response times. Honestly, I’m not even sure what the network station does. Now, for an accurate assessment, you’ll want to deploy the agents on as many physical desktops as possible. In terms of a VDI assessment, the more data you have the accurate your design will be. Some organizations may perform a “spot” assessment for a given department or grouping of computers, assuming these desktops perform the same function. That’s ok, but be mindful that by spot checking, you may miss some “special use case” in your assessment that may result in a specific machine not being a good fit for VDI. For small assessments, say up to 500 nodes, I prefer to run the hub appliance on a laptop using VMware Workstation and leave it onsite for 30 days. If you will assess more than 500 nodes, consider downloading and configuring the desktop appliance. Today, the desktop appliance can be used for assessments up to 10,000 nodes. The desktop agent can be deployed in any number of ways; manually from the hub appliance web interface, SMS or GPOs, and any other software distribution tool that works with .exe and/or .msi files. The agent is very small and uses approximately 0.3% of a single CPU core and 8MB of RAM. The agent must be pointed to a hub appliance and this too can be done manually during the install or through the Liquidware Labs GPO ADM template. FIT is not real-time monitoring tool, but from the hub appliance, you can control how often data is collected and how often the agents report. This chart provides a high-level overview of each system that has been analyzed. 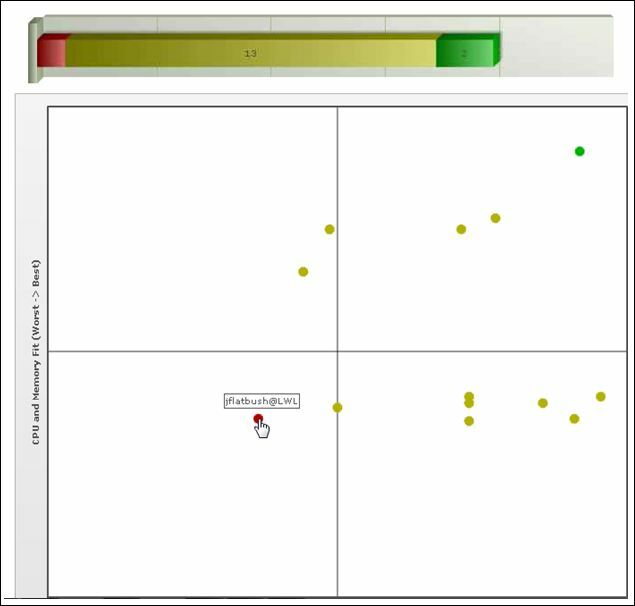 The clients best suited for VDI would be those found in the top-right quadrant, but the cool thing is you can click on any circle to get more information regarding that specific desktop to see why it may not be a good fit for VDI initially. Perhaps there is an old application installed that’s a memory hog, maybe weather bug, whatever, but upon analysis, you may find that more desktops are prime VDI candidates. Finally, in addition to the built-in reports, you can write our own queries using Excel or Postgres data utilities. I’ll be posting more, but if you’re looking at VDI, first look at performing an assessment using Stratusphere FIT….special thanks to Mark Jones and Chris Walker at Liquidware Labs, each have been a great resource. Thanks guys!